Bordeaux Neurocampus > Commented publications > Adult Hippocampal Neurogenesis in Human: Myth or Reality? In human, one of the hallmarks of many neurodegenerative diseases and brain damage is the permanent loss of neurons.Which raises the question of how could they be repaired when it occurs during adulthood? The key to stimulating repair mechanism of damaged brain regions may lie in studying the systems that continue to produce new neurons throughout life, also called neurogenesis. In 1960’s the idea regarding the production of new neurons in the adult brain started with the studies conducted by Joseph Altman and has been accepted only 30 years after by the scientific community. Soon after, accumulating evidences in monkeys (Gould and al., 1999; Kornack and Rakic., 1999; Ngwenya, 2015; Jabes, 2010; Kohler, 2010; Aizawa, 2009; Leuner, B., 2007) and Human (Eriksson and al., 1998; Ernst and al. and Spalding and al.) provoked multiple debates within the scientific community because they contradict Cajal’s work and his concept of “the immutability of the brain”. Although some studies have shown through various techniques that neurogenesis seems to occur in the dentate gyrus (DG) of the human brain, the debate is still in full swing. Earlier this year, Sorrells and al. published a paper titled: “Human hippocampal neurogenesis drops sharply in children to undetectable levels in adults”. Needless to say, this paper acted like a bombshell for the Neuroscience community, the neurogenesis field in particular. The paper even enticed many discussions within the non-scientific community due to various publications of articles covering it in multiple newspapers, such as: “Le Monde”. Nevertheless, the story does not stop here, a few weeks later Boldrini and al. published a study with opposite conclusion in a paper called “Human Hippocampal Neurogenesis Persists throughout Aging”. Then, what do we have to say about these two papers? Is the latter paper enough to give a full relieve for neuroscientists working on neurogenesis? How should we, as a scientific community, respond and draw conclusion from both publications? The first thing to highlight in Sorrells’s paper is their use of embryonic brain tissues with exactly the same histologic protocol as those they used in the older brains. Why is it a good point? It is mainly because they were able to show new neurons in the embryonic as well as postnatal and adolescent brains, which gave them a legitimacy to say that there is nearly no more neurogenesis when they did not observe the same in the adult brain. They used in this paper the same technical approach for monkey brains which confirmed their results. But can we apply the same protocols to two different species and neglect interspecies differences in the interpretation of the results? This concern can also be extended to the difference of the tissue’s age, as we know that in rodents twice the concentration of antibodies is commonly used for old tissue immunohistochemistry compared to young ones. The second thing to discuss here is Sorells’s DCX+/PSA-NCAM+ approach to identify immature neurons. The DCX+/PSA-NCAM+ markers used in many animal studies to label neuronal precursors and early immature neurons provides a reliable way to target newly generated cells engaged in the differentiation pathway. This approach has been proved to be efficient, though some aspects are still under controversy. Some has argued that it cannot be reliably used in certain conditions. In fact, it is known that in many neurons, the expression of one of those two markers could be decreased non-uniformly. This could result in false negative as there could be identification of a neuronal cell as non-neuronal. Furthermore, DCX can dramatically decline if tissues were not rapidly preserved and in this paper the fixation is made within 48 hours, which was the time limit set by Sorrells and al. for the fixation of their human and monkey’s tissue. Meanwhile, Boldrini and al. set their fixation time limit at fewer than 26 hours, which gave them the leverage in this consideration. Older studies have shown that time can affect brain proteins even within 26 hours’ post-mortem (Roy and al., 1986; Boekhoorn and al., 2006). The difference of results found in the two studies could be explained by the fact that the post fixation delay applied in Sorrells’s paper could have an effect on the results and put them at risks. It should also be noted that in Boldrini’s paper, all brain tissues came from adult donors and no differences were observed between men and women patients. All tissues were used for each experiment except for the double labelling immunofluorescence and stereology for Sox2/nestin in which three brains of similar age were used. In addition, a complete toxicological analysis was done to eliminate past drug use that might affect the results. As we know, in scientific studies we need to prove facts by reproducing data. This cannot be found in Sorrells’s study where we don’t know anything regarding the life and the medical record of patients and 3 of them died of unknown cause. It is possible those factors like the patient’s lifestyle (running, smoking, etc), pathologies (depression, anxiety…. ), and conditions like obesity, cognitive deficits or stressed events for example, could affect the brain and thus, the results of the study. It is therefore very important to consider these factors and others such as the donor’s age gap, in performing experiments in which the adult brain samples are very few. In Boldrini’s study they statistically demonstrate the correlation between aging and the decline of neurogenesis whereas in Sorrells’s paper there is no statistical studies because of the number of individuals per time point (n=1) showing the sharpest drop of neurogenesis. 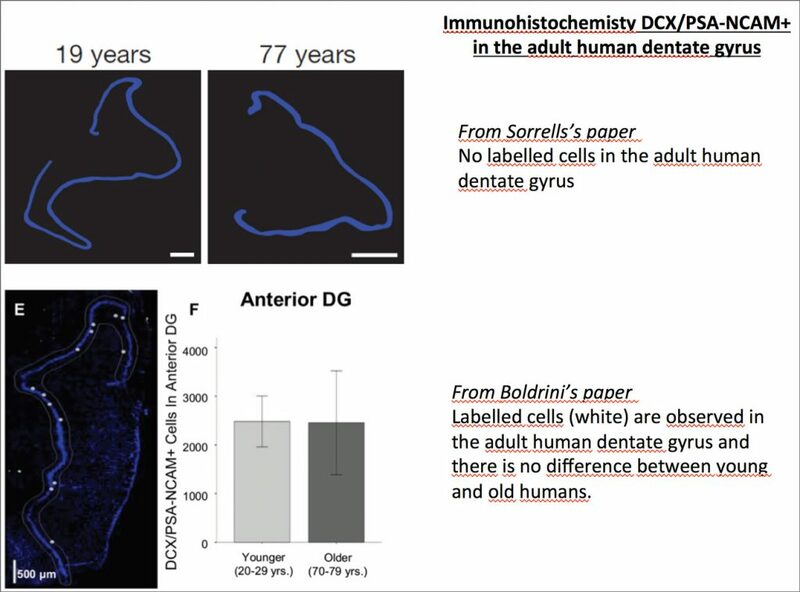 In the latter part of Sorrells’s paper, they still show rare neurons identification in aged humans and animals, which can be explained by the fact that their subjects have significant age difference. This concern, coupled with the fact that human samples are often rare, could make the whole study with only one individual per group and per gender quite tricky. The fact that the Boldrini’s paper is using more samples with fewer age differences allow them to make a more valid conclusion compared to Sorrells’s study. To conclude, we cannot say that Sorrells’s paper is sufficient to support the fact that there is no adult neurogenesis in humans. Studies where different parameters are more controlled and taken into consideration such as Boldrini’s (with defined post-fixation time, subject’s medical history, use of stereology, etc), could explain the inverse results. It has to be said that Sorrells’s paper is not trivial and it can be reliably related to some animal studies regarding the decline of neurogenesis throughout life. In our team, it has been demonstrated that adult new neurons are generated continuously in rodents with a decline in parallel to aging. We also found that it is the neurons formed during all adult life that are important for learning, therefore if there is no or little formed in the aged subject where the need for learning matters less, it is not so important. However, we do not think either one of these studies is enough to prove that neurogenesis is ceasing or persisting after the beginning of the adolescence period. Nonetheless, these studies deserve some attention as they reopen the debate of adult human neurogenesis. In the end, more studies aimed at comparing long life animals such as non-human primates and rodents are required. Furthermore, we need to develop non-invasive and non-toxic methods including in vivo imaging techniques in particular to monitor the adult hippocampal neurogenesis.